Jesus — Will He Ever Return? In these deeply troubled times, the question rises to the fore: Is Jesus Christ about to come back? Is the Second Coming real or myth? Newsmax magazine explores the issue with leading religious figures — uncovering the surprising controversies and new revelations surrounding the Second Coming of Christ. And we also ask: What does this mean for America? This issue of Newsmax magazine also includes a special feature, "Local Limbaughs: America's top 25 best local talk radio hosts" — and an interview with talker Glenn Beck, who expounds on Judgment Day, Armageddon, the 12th Imam, and Barack Obama's "frightening" policies. Why date-setting Christ's return is "horribly irresponsible"
Prognosticator William Miller and "The Great Disappointment"
What's ahead for the new Israeli government? Ultimate Fighting — sport or human cockfight? 2009 April: The Jesus Question: Will He Ever Return? 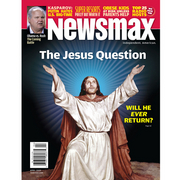 'The Jesus Question' Newsmax Special Report Newsmax magazine explores the issue with leading religious figures - uncovering the surprising controversies and new revelations surrounding the Second Coming of Christ.